Hotels have been slow to keep up with the advances in TV technology over the past decade. Most have upgraded their hotel rooms to the large, flat screen TVs we have in our homes today, but when you switch on the TV what you see is blurry, grainy programming delivered by the same analog TV system the hotel property has had for years. What that means for hotel guests is bad hotel TV. So Why Havent Hotels Upgraded Their TV Systems to HD? In a word, cost. Before the Com1000 Pro:idiom HD Headend was introduced in 2009, upgrading your Hotel TV system to HD was a costly, disruptive process for hotels with over 250 rooms or that do not have home-run type wiring. A huge constraint in upgrading to a HD TV System was the downtime required for either a property re-wire because of a lack of home run wiring or installing set-top boxes in-room. In a 24/7/365 industry like Hotels and Institutions, this amounts to a major cost in addition to the new TV system itself. Today major chains like Hilton, Marriott, and Hyatt and more recently economy and mid-scale brands like Choice, Best Western and Wyndham have increased pressure on properties to upgrade to HD programming to provide the full HD TV experience guests are used to at home. With so many hotel properties being franchises, enforcing these brand standards has proven difficult. Its all About Satellites specializes in DIRECTV for Hotels and DIRECTV provides two systems that have revolutionized TV for Hotels, lowering costs and providing guests with the TV experience they are used to at home. When it was introduced in 2009 the COM1000 HD Pro:idiom headend system was a revolution in Hotel TV Systems. Thee new COM2000 Pro:Idiom HD headend TV system brings the technological advances, convenience and the features that quickly made the COM1000 the industry standard hotel headend system. The Com2000 continues DIRECTV’s leadership in commercial-grade TV system solutions for both the hotel industry and for other lodging and institution properties. For properties with more than 250 rooms, that are constrained by brand standards to use Pro:Idiom encryption, by the cabling plant in your hotel, or for installations where you don’t want or cannot have receivers in-room, the NEW COM2000 HD Headend System from Technicolor is the perfect HD TV System solution. For properties using an existing analog headend, you may be worried about the downtime involved in switching to HD. It’s a very real concern, because in a 24/7/365 industry you’re talking about disconnecting TV in every single hotel room. With the COM2000 that worry is completely gone. 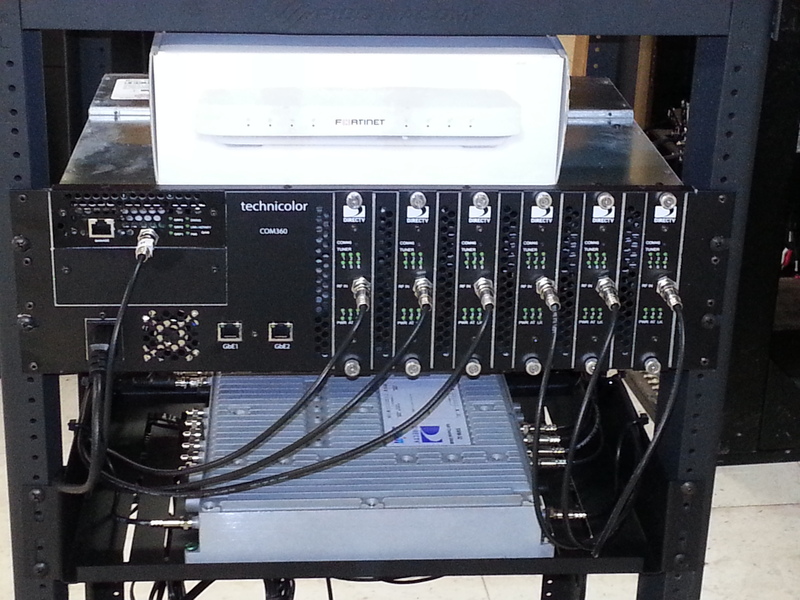 The system is direct swap-in for an existing headend and in most cases requires absolutely no additional cabling. The headend staging and design can be done before the system is hooked to hotel TVs and then it’s a simple matter of connecting the new system, disconnecting the old, and setting up the in-room TVs. The COM2000 brings many of the best features of the COM1000 into this new smaller and more energy efficient HD headend system while maintaining the nearly plug and play platform. This new system is super-stable and full-featured right out of the box. What Does It Take to Get HD Programming Into Your Rooms? DIRECTV HD video signal sent from a DIRECTV satellite to an installed satellite dish at a hotel property. The Pro:Idiom / LYNK transcoder is a modified DIRECTV receiver that converts high-definition DIRECTV signal into to a digital format that can be delivered through the hotel TV distribution network. Digital video is an exact replica of its original source without degradation and as such is easily pirated without encryption. The content owners such as ESPN, HBO, etc… now require that the signal be encrypted in hotel properties all the way to the television. LG’s Pro:Idiom technology and Samsung’s LYNK technology is a digital video content security system (DRM) designed to encrypt the signal so that only authorized HDTVs or televisions with a decryption box (set top or internal) can decode the signal and display the video on its screen. The Pro:Idiom / LYNK transcoder is built into the head end, one transcoder per channel. A QAM Modulator changes the frequency of the video signal so that each channel can be viewed on the desired channel number. For example, the QAM modulator could change the frequency for ESPN (normally DIRECTV channel 206) so that it can be viewed on channel 5 at your property. The QAM modulator is also located in the hotel headend system. Pro:Idiom by LG or LYNK by Samsung enabled HDTVs have the ability to decode the encrypted signal sent from the Transcoder so that the content can be seen by your customers Identification Module (IDM). Pro:Idiom or LYNK HDTVs also have an insertion point for the ID Module, which marks each individual room’s video signal with a unique and traceable key code for additional content security. Broadcast stations such as ESPN HD, HBO HD and SHOWTIME HD require this component in order to protect their content from piracy. 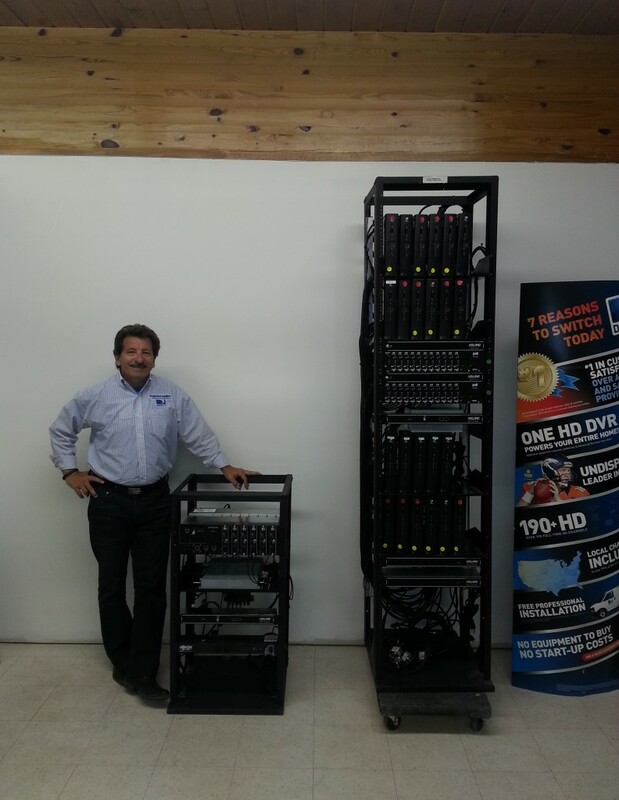 Does Your Hotel Need a COM2000 HD Headend? For newer hotels and older properties with newer wiring, often the best option for providing Free-to-Guest HD TV is the DIRECTV Residential Experience for Hotels. Its provides full channel availability in-room, a TV viewing experience more like the one your hotel guests are used to at home, and added functionality for the hotel property including the DRE Welcome Screen System. The very best way to determine if your hotel needs the new COM2000 headend system to deliver HD programming to your guests is to have an experience, SBCA certified technician do a site survey of your property. Ideal – Compression Connectors in high frequency wall plates. If your property meets all the above requirements and you have fewer than 250 rooms, you may be a good candidate for the DIRECTV Residential Experience. If those are not available in your property our certified technicians will determine whether it is cost effective to upgrade your cabling plant or if a DIRECTV COM2000 Headend system from Technicolor would be your best option. 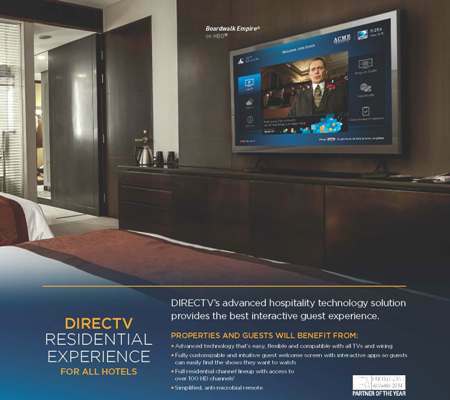 The DIRECTV Residential Experience (DRE) is an advanced TV System for Hotels with home run wiring and less than 250 rooms. The DRE provides hotel guests with the full DIRECTV TV experience they have at home including the interactive channel guide and remote. It gives the hotel property full channel availability in-room, remote monitoring and starting in December 2014 will also provide a welcome screen system that includes up to 8 on screen apps for quick access to hotel information, local information, weather, and guest check out folios. The DIRECTV DRE is a fantastic and upgradable solution for many hotels.